If you are looking for information on the Blue Moon franchise business opportunity, Blue Moon Mexican Cafe franchises or Blue Moon Cafe franchising, then you have come to the right place. Honey what should we eat tonight?... Italian?...Chinese?" "I wish there was something different!" That's where we come in! We are the difference between boring and exciting, between dull and spicy, between the same old thing and something completely different. Most importantly we are the difference between tired old restaurant chains and owning the best Mexican Restaurant Franchise around. I Would Like To Introduce You To The Blue Moon Mexican Café. We are a full service neighborhood Mexican restaurant that caters to all demographics with an emphasis on families. We serve fresh home made Mexican and Southwest fare in a fun and inviting atmosphere. With our emphasis on quality and our dedication to phenomenal service we have become a favorite in the New York/Northern NJ area. Now Through Our Franchise Program It Can Be Your Turn! I started Blue Moon over 20 years ago in one of the toughest markets in the world, Manhattan, NY. Along with my brother we opened 3 locations around the Big Apple. In 1995 I expanded my horizons and opened the first suburban location. I was actually stunned by the success. Apparently there was a definite need for something different and fun. Over the next 10 years I opened 4 more locations in varying suburban areas. What I found is that The Blue Moon concept worked in many different types of locations, from downtown Main Streets to strip malls. One of the big secrets to our success has been perfecting our take-out and delivery business. Whether you have 60 or 100 seats in your location there are always thousands of more guests with seats in their own homes just waiting to be fed. In addition we have a community based marketing system that turns good deeds into sales. Over the last 20 years we've learned from experience and yes even from our mistakes. We've taken that experience and honed our systems so that we can teach a dedicated individual how to run a successful Blue Moon Mexican Café. A Red Hot Opportunity In A Growing Market! Mexican cuisine is quickly becoming a staple in people's diets. The Blue Moon Café Menu offers options with fresh and flavorful ingredients, like the traditional salsa, guacamole and refried beans. There are many different menu options for all preferences, including salads, fajitas, quesadillas, giant worldwide burritos, and more. All items are prepared fresh daily. 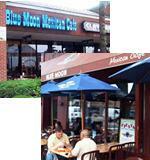 A fresh, flavorful, competitive opportunity, The Blue Moon Mexican Café format is optimal for franchises. The Blue Moon Mexican Café operation offers freshly prepared menu items, following our own specially developed recipes, and streamlined procedures that help you run your business effectively. We'll show you how to do it all. Our professionals will provide thorough pre-opening and ongoing support to help you run your Blue Moon Mexican Café franchise. Interested in owning your own popular, fresh, and flavorful business with the Blue Moon Mexican Café support team backing you up? Take the next steps toward finding out if our franchise opportunity is right for you.